Suppose, theoretically, that you are already bored with Atraxa, Praetors’ Voice. You’ve already built Atraxa as Infect, Planeswalkers, Thallid tribal, and even Angel/Horror tribal just to tone it down a notch. I’ve played multiple games recently against two different Atraxa builds at the same time, which is a testament to her power, popularity, and versatility. However, maybe you want to try something different. 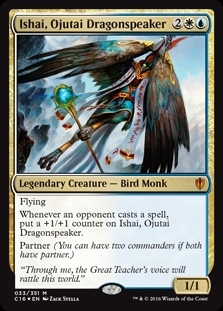 Ishai, Ojutai Dragonspeaker is a flying face-puncher that enlarges itself naturally. If you’ve seen a Taurean Mauler, Managorger Hydra, or a Sunscorch Regent work, then you have an idea how quickly Ishai can inflict 21 damage. When Ishai is your commander, then that’s one dead opponent. Buying an Atraxa Commander 2016 precon gives you most of the parts for a solid deck partnering Ishai with Reyhan, Last of the Abzan. The precon is very well suited for supporting +1/+1 counters on creatures with Corpsejack Menace, Hardened Scales, Kalonian Hydra, Cathars’ Crusade, Deepglow Skate, Vorel of the Hull Clade, Champion of Lambholt, and more. You could even keep Atraxa in the 98 instead of being the commander (“Blasphemy!”, I hear the internet say). Looking at Ishai’s EDHREC page at the time of writing (109 decks), the Signature Cards section looks like the precon with some land upgrades and Swords to Plowshares. The presence of green and black shows that the decks processed to date aren’t venturing far outside of Atraxa’s realm. Let’s see what else we can build. To make this a more interesting exercise, I’m not going to use green or black in my final deck. Now to find out what a Jeskai Ishai build could look like. Sharp-eyed readers may see some repeats from last week‘s lists. Luckily, we have another partner on the list with Kraum. The idea of having two flying commanders beating faces is new and appealing to me even if their commander damage is tracked separately, so Kraum it is. 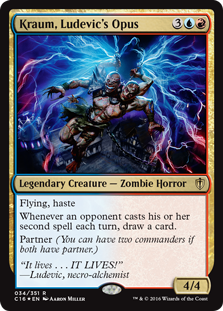 Bruse Tarl would be another decent choice to support Ishai, since this Boros version of Xenagos, God of Revels works well with any commander that focuses on combat damage. With only 18 decks this commander is dragon tribal, and it’s not even the best commander for dragon tribal. I suspect 18 players out there lost one too many games against their friends’ Shadowborn Apostle or Relentless Rats decks and started looking for payback. While Arcane Laboratory could be useful for last week’s Vial Smasher article, it’s not appropriate for Ishai. We don’t want to discourage our opponents from casting spells. Extrapolating a bit, Grand Arbiter Augustin IV is also not going to be included, so you’re not going to be the worst person in the world. If you want to play a counterspell deck with Ishai, you still can. Countering a spell doesn’t stop your opponents from casting a spell, it just stops their cast spell from resolving. There are only 6 decks for Ishi-Ishi, but some cards still stand out. 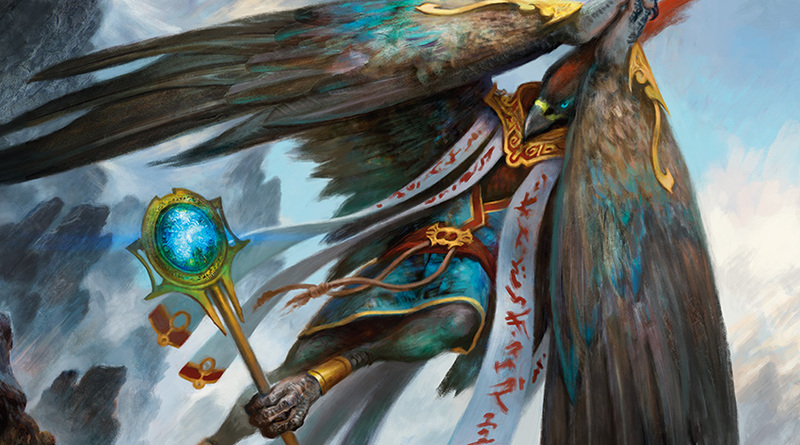 Archetype of Aggression lets Ishai trample some damage through your opponent’s Birds of Paradise. Thundermaw Hellkite is another way to get Ishai (as well as Kraum) through some flying blockers. Dictate of the Twin Gods can be held as a nice surprise for when Ishai is up to 11/11. We want our opponents to cast spells, but we don’t want them to hurt us too much. Defensive cards like Ghostly Prison and Norn’s Annex discourage opponents from attacking you with the creatures they cast. Digging further into those cards gets us Propaganda and Sphere of Safety. What if we let opponents cast creatures but they come into play tapped? 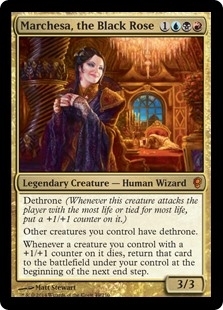 Blind Obedience, Authority of the Consuls, and Thalia, Heretic Cathar give us an extra round to fly in some damage before new creatures can block. 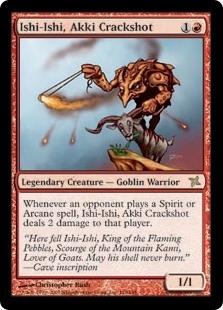 There’s not much new here that I want to use with Ishai, but Kazuul, Tyrant of the Cliffs can be considered the red version of Ghostly Prison. 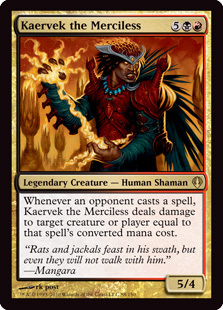 Both of our commanders get benefits when our opponents cast spells, so if you want to add more red punishment for other opponent activities, Kaervek is a good place to look. 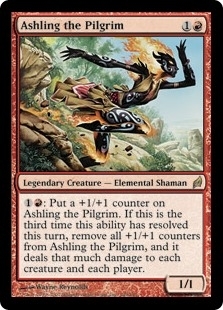 One of my personal favorites, Ashling adds more mono red spells as well as a nice suite of artifact equipment for either of our commanders to wear into combat. Grafted Exoskeleton may make your games shorter at the expense of having fewer friends. 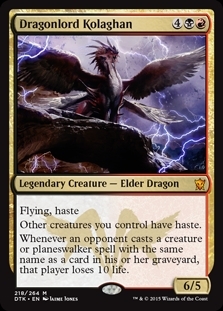 A Bant flyer that accumulates counters seems like a solid mechanics match for Ishai. 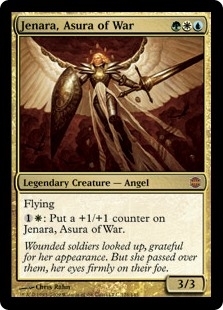 However, you may notice from Jenara’s page that there is no Signature Cards section. 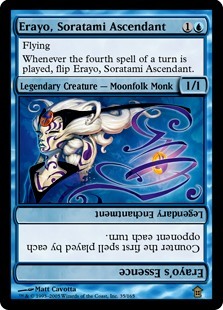 This is because the cards across her 361 decks do not have a high enough synergy score, which is EDHREC’s measurement of whether a card is played more often with a particular commander than with other commanders who have the valid colors to use that card. Low synergy scores across the board indicates that the decks are mainly using “good stuff” cards that are generally popular in given colors. These cards could be useful to add and are usually commander staples, but we’re unlikely to find much that pertains specifically to Ishai’s strategy. Do you know about the word? 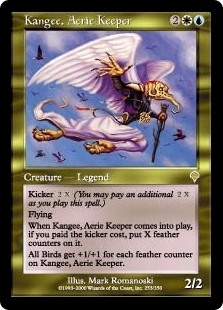 At 96 decks uploaded, every one of the 14 Signature Cards for Kangee have the word “bird” on them. 11 of the 14 Top Cards have “bird” as well (12 if you count Door of Destinies). If you like bird tribal, Kangee’s page is a good start. Favorable Winds and Gravitational Shift work on flying creatures in general, which helps Kraum too. 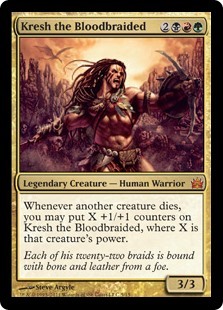 Like Ishai, Kresh the Bloodbraided becomes large over the natural course of a game. Looking specifically for red cards, Chandra’s Ignition, Fling, and Stalking Vengeance can all convert a creature’s power into direct damage upon players. 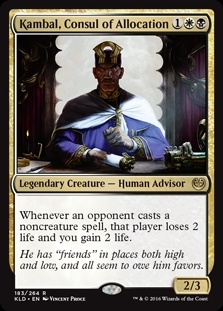 Digging into any of those cards’ pages shows that they are also used with Brion Stoutarm in the Top Commanders, who happens to fit in our Jeskai colors. The original Marchesa has a fairly specific strategy, but we’re sure to find some good creatures that add their own +1/+1 counters. Namely, Dack’s Duplicate, Chasm Skulker, and Scourge of the Throne. Marchesa’s Smuggler, while only a 1/1, can make either or both of your commanders hasty and unblockable. Zurgo matches two of our chosen colors and is designed to do combat damage. If you didn’t find any artifact equipment that you liked under Ashling, then you can probably find some on Zurgo’s page. The idea of passing around an ever-growing Ishai with an Assault Suit is intriguing, since you can let your opponents deal commander damage to each other. Hero’s Blade works with either of our commanders and turns Kraum into a three-hit kill instead of six. Also, if you were looking for white/red combat effects, Zurgo has them. Aurelia, the Warleader, Gisela, Blade of Goldnight, and Iroas, God of Victory all do things that are good for combat-based commanders. There are also some effective lands in this category like Slayers’ Stronghold and Sunhome, Fortress of the Legion. To make sure we haven’t missed any good white/blue/red cards, let’s do one last search for legendary creatures that share all three colors and only those colors (AND “white blue red” NOT “black green”). Gatherer’s Color filter only looks at the card’s mana cost, not the cost of activated abilities which can affect a commander’s color identity. Other search sites such as magiccards.info have a separate search field for “Color Identity (Commander)” that fixes this omission. 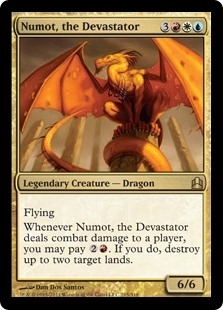 Like the aforementioned Jenara, Numot has no Signature Cards that are widely considered to synergize particularly well with that commander. At this point, we’re just looking for Jeskai good stuff to fill out the deck so that is fine. Next time: Tana, the Bloodsower!? !